What is ING PPS (Private Portfolio Service) Funds? Private Portfolio Service is a master trust administered by ING. It has been developed as both a series of unit trusts and a superannuation fund, representing a broad range of asset classes and fund managers. Private Portfolio Service provides investors with the opportunity to diversify their portfolio, without the need to rebalance different investments across a number of fund managers and products. Someone definitely has to do a quantitative research on these funds, right? What's the purpose? To find the best and optimised alocation of a portfolio of one's retirement plan or any investment plan. Based on their daily/monthly historical prices, I calculated the daily/monthly log return of each PPS fund, Ln(P2) - Ln(P1) to show the continously compounded return. 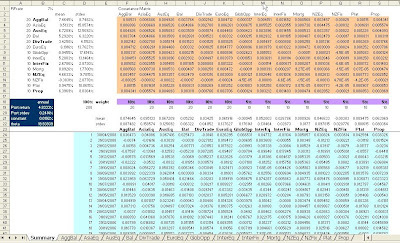 I then calculated the mean and standard deviation of each fund and built the covariance matrix. Next, I calculated the portfolio mean and standard deviation. 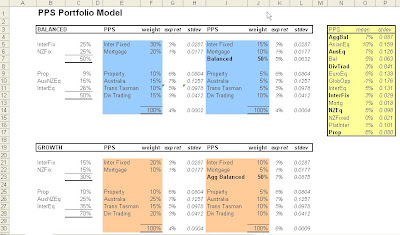 Finally, using solver, the optimised allocation is found by assuming risk free rate 7%. Contact me to get the optimised allocation and the spreadsheet, if you're curious or just checking with your own calculation. Please confirm if these annualised monthly means and standard deviations are close with your calculation for data ending 21 Jan 08. This is an optimisation of a portfolio of optimised funds as a managed fund is a portfolio which is optimised regularly by its fund managers. Putting into practice, some clients don't believe in this simulation. This is because the simulation is based on the daily prices and they don't concern this kind of time horizon. For getting the best point of view, in my opinion, it is best simulated from monthly prices, not daily prices.